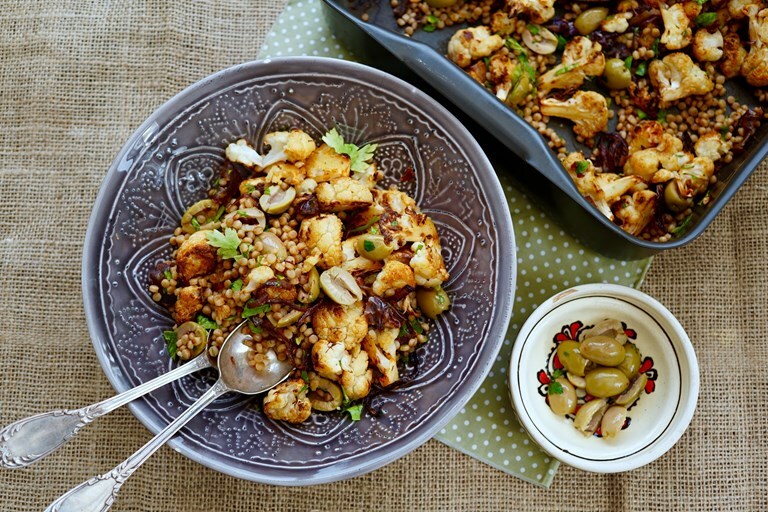 Punchy green olives, gooey Medjool dates and spiced roasted cauliflower are the stars of this fregola salad recipe. Feel free to swap the fregola for giant couscous or other small pasta shape of your choice, if preferred. This dish is equally good cold, and would make a great make-ahead packed lunch dish. Cauliflower is an underappreciated vegetable. Positively anaemic-looking compared to its vibrant cousin, broccoli, this understated brassica has long been unfortunately associated with grey soup and mushy cauliflower cheese. However, the humble cauliflower is full of nutritional goodness, and when treated properly has a delicate creamy, nutty flavour that works well in a whole host of recipes. 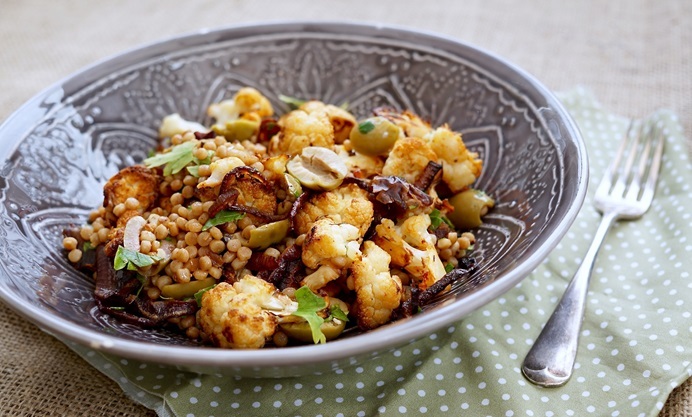 The best way to treat cauliflower is to smother it in herbs and spices with a little olive oil then roast it in a very hot oven, until the edges become nutty and crispy and the inside soft and fudgy. The white flesh is like a sponge, absorbing all those lovely flavours you throw at it. Here I’ve bathed cauliflower in a mixture of saffron and paprika, which turns the florets a vibrant gold and emphasises their delicate creaminess. 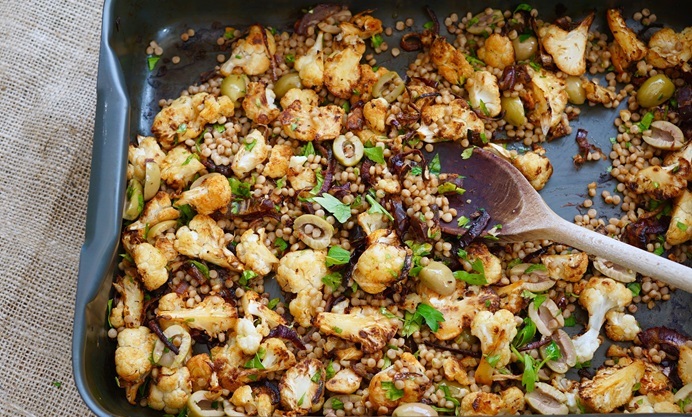 The roasted cauliflower becomes the base for a vibrant Mediterranean pasta salad, rich with crunchy roasted red onion, tangy lemon juice, fresh parsley and the wonderful combination of sticky Medjool dates and green olives. I use Crespo pitted green olives with herbs and garlic, which are beautifully plump and savoury and very easy to use, with none of the mess you get with olives swimming in brine or oil. Their delicate herbal, garlicky flavour works wonderfully to season the salad, and their rich saltiness couples perfectly with the sweetness of dates. I’ve used Sardinian fregola pasta as the base for this, as the pairing of salty olives with sweet dried fruit is a particularly Sardinian combination, but you can also use giant couscous, which is very similar (or other small pasta shapes if both of these elude you). The warm pasta soaks up all of the lovely flavours from roasting the cauliflower and onion, and provides a deliciously textured, nutty base for all the complex flavours of the salad. It’s beautiful to look at, too – a rich palette of gold and green.